Clark perceptively identifies what I consider to be the central challenge for Buddhism, which is the question “Why should the destruction of illusion lead to compassion rather than to cynicism as it often seems to in everyday life, or to social conservatism as it has in the case of Humean and other forms of philosophical skepticism?” Buddhism traditionally asserts that this is just what will happen: if you proceed on the Noble Eight-fold Path, in a guided way consistent with the process outlined by the Buddha and his disciples, you will eliminate the sources of egoic illusion and will naturally, spontaneously, begin to experience compassion for other sentient beings. Deleuze & Guattari’s exhortations to pursue “lines of flight” and “deterritorialize” can be seen in this light. Not all self-deconstruction is ego-deconstruction, and not all ego-deconstruction is guaranteed to be empathogenic. It helps to have the guidance of a dharmic community, a sangha, within which to perform it. The leap of faith of a neo-Buddhist globalism, perhaps, is that humanity (or maybe humanity plus nature) can be that sangha — which is why both communication/dialogue and social justice are called for, because we’re all in it together, or we aren’t in it at all. I want to end by coming back to my point about the complementarity of Deleuze and Derrida, or of what I would call the Deleuzian Buddha and the Derridean Buddha. It’s often been noted, including by Derrida himself, that Derridean deconstruction shares much with the negative-theological traditions of Asian thought. As I’ve argued before, Derrida’s focus on language limits his project. Nagarjuna does essentially the same thing, but his approach is more radical in that it calls for the deconstruction not only of the concepts that structure our experience, but of the experience itself. That’s where philosophy becomes psychology (and, ultimately, what goes by the term “mysticism”). Varela, Thompson, and Rosch made much the same argument in The Embodied Mind, and the Varela-founded Mind and Life Institute provides a space for developing both the science and the psychology of this line of work. Where a Derridean/Nagarjunian deconstructive project helps us see through the constructs we believe to make up the world (of individual ego and of collective/social ego — the nation, the empire, the state, the body politic), an affirmative project such as Deleuze’s — and the life-affirming thread within Mahayana Buddhism, as Clark argues — provides a necessary complement. I resist the idea that these make up two fundamentally opposed approaches, an “ontology of lack” versus an “ontology of abundance,” as Tonder and Thomasson’s Radical Democracy puts it. They are complementary, with the deconstructive and psychoanalytical (and here we need a lengthy excursus on Lacan, object-relations theory, and much else) taking away from the self/ego structure (social and personal) whilst the affirmationists (Deleuze, Whitehead, Bergson, Connolly, et al) provide means to orient ourselves within the space that has been vacated in its wake. Connolly’s idea of “relational arts of the self” — all those ways (ritualistic, psychophysical, et al) in and through which we can wean ourselves away from resentment so as to more fully embrace the earthy reality of the relations in which we find ourselves — points to the work we can do individually toward this end. As inheritors of the spiritual traditions of millennia, with a growing knowledge of how the bits and pieces of those traditions affect us physiologically, psychologically, socially, etc., we have a lot to draw from (though, of course, I wouldn’t suggest that traditions are there to be poached indiscriminately, without sensitivity to the political relations circumscribing them). 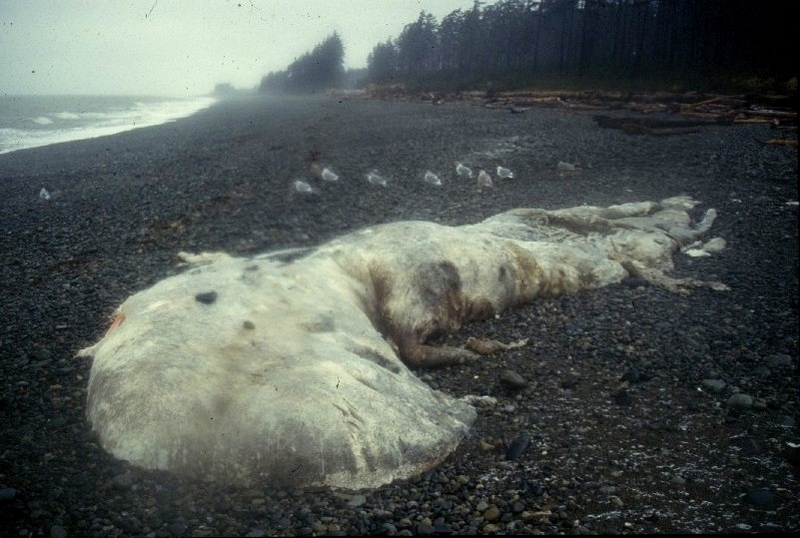 The photo above is of a decomposing whale carcass I came across on a beach near Tlell, Haida Gwaii (the Queen Charlotte Islands), several years ago. Kvond: From my Spinozist direction I do not find a leap of faith at all, but rather the immediate impression of an Intution of connectivity. If negation breaks down our imaginary constructs of separateness (and THOSE connections), what is communicated is a new connectivity, one risks saying, a “wholeness” to which it is almost absurd to postulate anything by compassion. When the connectivity is experienced it would be like asking, “When you realize that you are your hand, and not separate from it, why should you be compassionate towards your hand?” The mutuality that is experienced becomes the condition for compassion itself, wherein previous compassion was merely a confused version of the same. Why should an organism be compassionate towards its ecosystem of which it is an expression? Answer contained. I understand your spinozist point, but I think that the ‘leap of faith’ is to be understood in the particularities of the soteriological perspective which underlies Buddhist thought as a whole. The illusions of permanence (of the world *and* of the self) are to be dispelled via an awareness of the emptiness of things, but the main difference between Nagarjuna’s Madhyamaka and the previous Buddhist canonical doctrines (Abhidharma) is that where the former system allows for the existence of minimal, impermanent but identifiable ‘building blocks’ (dharmas) forming objects and five aggregates(skhandas) composing the self, Nagarjuna’s radical move is to advocate emptiness (= lack of inherent existence) of *all* entities, not just of compounds such as macroscopical objects and of the self. This is to say that, as I see it, connectivity (as a base for compassion) is to be used with care, because of our natural tendency of essentializing the network or the process itself. Spinoza’s unity refers back to God, to substance, while for Nagarjuna emptiness is itself empty, must negate itself: there is nothing whatsoever similar to substance in his system. It is not that all is sunya (empty) because all is co-dependently arisen. This is actually incorrect. Things are co-dependently arisen *because* they are sunya. In my opinion, this apparent nonsense leads to the key concept to understand the possibility of worldly compassion, the doctrine of the Two Truths, a conventional one and an ultimate one. The ultimate truth of everything is emptiness, which is itself empty and not a final substratum. But, at the conventional level, the one of codependent origination, we can act with compassion towards this networked reality through recognition of its emptiness. Of this second regime to truth, the word ‘samvrti’ can be loosely be translated as ordinary; everyday; true by agreement; nominally true but also concealed, hidden as something that conceals the ultimate truth/reality. Compassion therefore is the will of the enlightened to help every sentient being to dis-cover that they actually, always already are empty. And compassion is precisely so *because* it is completely void of self-interest, coming from a ‘being’ which has full realization of its own emptiness. That’s right, compassion comes into play not in the dialect of the ultimate truth, where all things join, but in conventional dealings, where the distinction compassion acts as a tonic to our throwness towards animosity, and our “faith” in the error of others, which some might argue is our rejection of our projected shadow, excuse the Jungian idiom, let me know if there’s better terms for this. Yes, well the terminology might be heterodox, but the basic idea is there. More technically one must reject avidya (ignorance or self-delusion) which is the very thing which keeps samsara (the changing world of appereances) in motion and the first link of the chain of causation, and obtain prajna (wisdom) which is nothing but the awareness of emptiness. Still, your point is correct. Compassion itself is conventional, not ultimate. But still, there is nothing which is ultimate if not emptiness itself. So in a way compassion is the best way of conventional action. I suppose that’s why meditation is so important. In my experience, it can almost surgically break the chain of self-grasping thought cycles that fuel the avidya/self-deception, if, in fact, one is really willing to trust the unknown and let go of one’s defensive self-project driven delusions. I certainly warm your explication of the Buddist response of faith, but I was trying to address the expansion that Adrian called to the for, his response, and not Hume’s. So a requisite answer cannot ONLY include Buddhism. Once humanity has been obliterated, calling Substance Nothingness or not means little. From a Spinozist perspective, immune from the negations of Idealism, because it is more than Idea that is affirmed, the “reference” is not back to Substance, but is to one’s expression as Substance, participation in all those things that are also such. Ideas such as “negating the emptiness” is to call one away from our present instantiation. Spinoza too was accused of nihilism. It is the primary charge of the Pantheism Controversy. Spinoza is entire point though is a point of CARE. I certainly can appreciate your Buddhist solution to all the talk of negation. For Spinoza the negation is an illusion to be overcome. The question is always an affirmation. Nothing is ever lost. Investment is a condition of our Being. In a certain sense, Spinoza grounds compassion in a much more present, much more grammatical fashion, in that which is ever and always of that which we consist. This doesn’t mean that there is no room for a Buddhist connection, but if Hume is going to be answered (and he was influenced by Spinoza it has been argued), at least in the Western tradition, it cannot come out of the thought of the “negation”. Following Nagarjuna’s example always implies a potential risk of turning into a troll. Overemphasizing negation and refutation one easily slips into a kind of parody. And I think this is similar to how his method possibly could lead to cynicism. Just tearing things down won’t do any good. A possible antidote might be to simply view it as a kind of relaxation exercise of habitual clinging. Its basic aim just to unlearn any automatic responses of instantly rebuilding whatever gets destroyed. When relaxed, paying attention to the world around, I find that compassion was already there. I was just too busy before to see it. No special ontology or mystic state of “emptiness” needed (although put clumsily like this, it might sound a little too much like imbecilic mockery). As for speculating on ontogenetic explanations of this compassion… Maybe it has something in common with what Trevarthen calls “primary intersubjectivity”, the infant’s apparent ability for preverbal interaction, which also seems to be supported by recent work done in mirror neurons. Add anthropomorphism for a complete extension to all sentient beings. Kvond: I think that this is very interesting and goes right to Spinoza’s psychology. Whenever we think we have ideas about something in the world “out there” these are inherently really ideas we have of our own internal condition, projected out, imagined to be caused by those external events. The relaxing of habituation of mind, in Spinoza, is cutting the circuit of cognitive blame (or praise), realizing that our own states are the result of affirmations of ourselves, and not truly brought about due to external states, per se. The loop from self to world and back is broken, only to be reconstructable along more whole, coordinated lines.